Thanks to a lifetime spent in Southwest Florida and the last forty years at the helm of her company, Michael Saunders has sat squarely at the epicenter of one of Florida's fastest growing and most desirable regions. One of the surest barometers of that growth and desirability is the parallel expansion of Michael Saunders & Company® during the same period. In 1995, the company enjoyed annual sales volume of just over $274 million. Ten years later that volume had increased eleven-fold, rocketing upward to the tune of $3.07 billion. Nothing about this phenomenal growth has been accidental. It was never about luck or being in the right place at the right time—although Michael's native-born understanding of the region didn't hurt. Growing up along the coast helped her identify major gaps in the real estate market that were being woefully underserved at the time. Above all, she set out to provide buyers and sellers of fine coastal properties something they didn't automatically expect from a real estate company back then—outstanding customer service, uncompromising integrity and a brand of cutting-edge marketing rarely seen in the real estate industry. Her many years of hard work and hands-on stewardship have been rewarded with their equivalent in success. Now halfway through her fourth decade as the dynamic force behind a real estate enterprise that today employs nearly 700 professionally trained agents and an administrative staff of nearly 200, Michael has propelled the company toward a new level of international distinction. Already well-known globally for representing the finest properties on the Gulf Coast, Michael maintains close ties with leading names in worldwide real estate and maintains powerful affiliations with the worlds leading brokerage networks—including Leading Real Estate Companies of the World, Luxury Portfolio International, Christie's International Real Estate, Mayfair International Realty and The Realty Alliance. After receiving twin degrees in history and psychology from Florida State University, Michael began her career as a history teacher at Manatee High School—in Bradenton—before joining the Manatee County Court System as a juvenile court counselor. Then, as a single mother raising a child on her own, she sought a new career direction that would provide greater independence and financial security. With $5,000 borrowed from an acquaintance—because banks frowned on lending money to single women back then—Michael debuted the company in 1976 as a single small office on Sarasota's St. Armands Circle. Since then, Michael Saunders & Company® has grown into a regional network of 24 full-service real estate offices spanning Florida's Gulf Coast from Bradenton to Punta Gorda. In addition to its worldwide capabilities, the company now offers a comprehensive range of customer-oriented services, including residential and commercial sales, new homes marketing, commercial property management, resort management and corporate relocation. Additional services include MSC Mortgage, MSC Title, MSC Assets Management and REO Divisions. With success comes added social responsibility and Michael has maintained a deep and longstanding commitment toward enriching the community life of Southwest Florida. Her groundbreaking achievements in real estate notwithstanding, Saunders never lost her love for teaching or allowed her focus on real estate to diminish her strongly-held conviction that one person can make all the difference in the life and welfare of a child. To this day, her philanthropic activities largely involve underwriting programs that protect, educate or otherwise enhance the quality of life for children and young adults. These noteworthy causes include All-Star Children's Foundation, Boys & Girls Clubs of Sarasota and Manatee Counties, Brothers & Sisters Doing The Right Thing, Child Protection Center, Junior Achievement, Habitat for Humanity, Community AIDS Network, Florida Studio Theater's Children's Write-A-Play Program, Education Foundation of Sarasota County, The Florida State University Foundation, Manatee County Schools Foundation, The University of South Florida Foundation, The Foundation for Manatee Community College and Ringling School of Art & Design. In her time away from the office, Michael's commitment to the environment—plus her passion for fishing, the sea and the awesome natural beauty of the native Florida landscape—has led her into active involvements with Mote Marine Laboratory, where she is an honorary board member, and The Marie Selby Botanical Garden, where she is a past Chairman of the Board. In 2015, Saunders was named to the Inman Top 101, recognizing the most influential people in U.S. real estate. 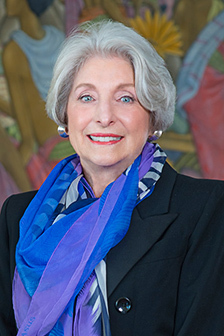 In 2003, Saunders became the first female recipient of the Florida Enterprise Medal, an honor bestowed annually by the Merchant's Association of Florida. In accepting the honor, she joined some of the most distinguished and influential Floridians of the past thirty years. That same year, she was named "Citizen of the Year" by the Sarasota Kiwanis Club and was honored by the Sarasota Community Video Archives with a cinematic time-capsule depicting her countless contributions to civic life. Michael Saunders & Company® has been named one of the top 500 women-owned businesses by Working Women magazine, ranks third among leading women-owned businesses in Florida and is listed among the top 100 businesses in Florida by The Tampa Bay Business Journal. Michael has appeared on the cover of Florida Trend magazine, was awarded "She Knows Where She's Going" by Girls Inc. of Sarasota County, and received the Visionary Award from The Marie Selby Botanical Gardens. In 2004, Saunders earned statewide recognition by being named Ernst & Young's "Entrepreneur of the Year." That same year, the company was awarded the prestigious "Excellence in Industry Award" by Sarasota's Committee for Economic Development. Moreover, Michael Saunders & Company® is regularly cited in the media for being among the region's largest and most admired companies; and its founder for being one its most admired citizens.